Loving 14kt Two Tone diamond heart pendant. 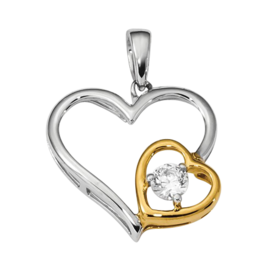 White gold larger heart is accented with a smaller yellow gold heart and featuring a 1/5ctw diamond in it's center. This pendant measures 21mm top to bottom by 18mm across. Bail is 6mm in length by 2mm wide. 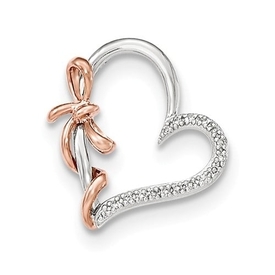 An adorable diamond heart pendant.